A colleague remarked to me yesterday, as we were trudging up the two flights of stairs from the tea-room to the third floor, “I’m sure they turn up the force of gravity in this building each year.” I feel like that too, sometimes. However, I suspect it has more to do with the aging process that any changes in physical constants. But…what if…? What would life be like if gravity were say, double what it is now. How different would life be? There are many ways of tackling that question. So I’ll phrase it in this way. Imagine that there’s another universe in which a similar-sized and atmosphered Earth exists, but where the force of gravity is double what it is in this universe. What might life look like on that Earth? First, I need to say that the ‘Earth’ itself would be different in many ways. The atmosphere could be very different, the structure of the earth very different, the shape and size of mountains very different, etcetera etcetera. But let’s narrow it down, and suppose the Earth itself is the same, It’s just the force of gravity that’s different. What would people look like? (Again, assuming this new Earth evolves people). Well, we’d need stockier legs. Why? If we double our weight, we’d need more surface area in our leg bones to support it. We’d start looking more like elephants. But, that’s just one option. An alternative is that double-gravity-Earth-humans could look exactly like our-Earth-humans, but with all our dimensions halved. (Yes, with a bucketful of assumptions.) How does that work? The stress in our shin bones would be given by the weight supported by the bone, divided by the area squared. Now, our weight would scale as the force of gravity times our volume; the latter scales with our dimension (e.g. height) cubed. But the surface area squares as our dimension squared. So the stress in our shin bone would scale with gravity times dimension cubed divided by dimension squared, which is gravity times dimension. If gravity doubles, and our dimension halves, we our back to the same stress. So, our sister-beings could look exactly as we do, but just be half our height (and half our width). Rather like hobbits, minus the furry slippers. However, that’s not the same thing as saying that life for them would be the same. Let’s consider the double-gravity-Earth-Olympics. Would they be able to do the same sports that we do, just at a different scale? At first glance, it might seem yes. Take running. Half the size, and (roughly speaking) you’d expect them to run slower – they cover less ground with every leg swing. So they’d still be able to have running races, but for them the 100 m would seem like a longer distance than it would for us. To compensate for this, they’d make their track smaller. But what about the pole-vault? This event is a great example of physics. The faster you run with the pole, the more it bends when its planted in the… what is it called?….and the more spring force upwards it gives you. Basically, it comes down to kinetic energy of the athlete being converted to gravitational potential energy, via elastic potential energy in the bent pole. How would this work in the double-gravity-Earth-Olympics? Let’s just estimate the height one can pole-vault by a simple equating of kinetic energy = potential energy. That gives us mv2/2 = mgh, or h = v2/2g, where m is the athlete’s mass (note how it cancels in the expression for h), v is his or her velocity on the run, and g the acceleration due to gravity, and h is the height they vault to. If we double g, h will halve, so long as v stays the same. But for sure our diminutive sister-humans will be running slower than us, because they are smaller. So v doesn’t stay the same, it’s lower. With g doubling, that means h, the height of the vault, is more than halved. So, measured in terms of how many times their height they can vault, it will be less that us. The pole-vault event isn’t then just a scaled-down copy of ours. Likewise, their rugby fields won’t look in exact proportion to ours – their cross-bar will need to be lower than ours as measured in terms of the average player’s height. One can take this line of thinking a whole-lot further still, but I’ll leave it there. 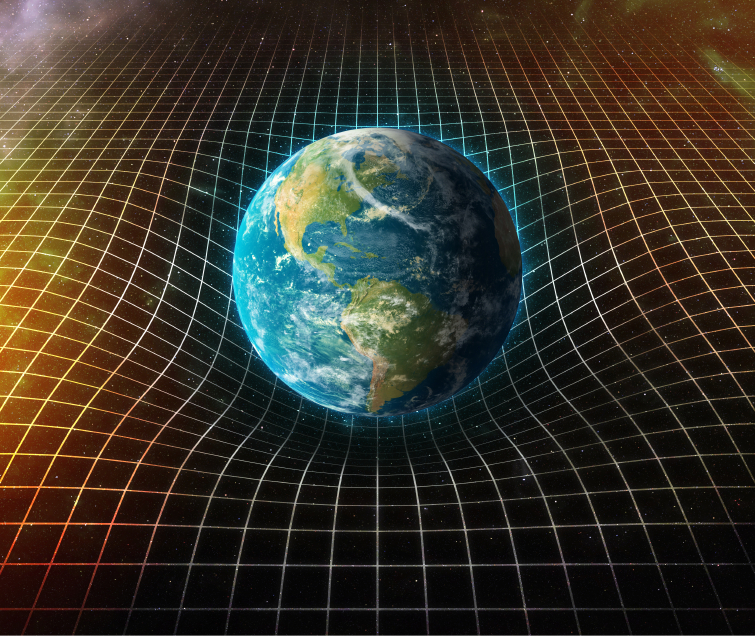 Gravity what a joke, warped space time hilarious.